This week I decided to combine a sea floor image with a post about a paper that came out in Geology this month about everybody’s favorite topic — sediment transfer to the deep sea! The paper is called Highstand transport of coastal sand to the deep ocean: A case study from Fraser Island, Australia by Ron Boyd and coauthors mostly from University of Newcastle. Click here to go to the Geology site where you can view the full text or download the PDF (subscription required). The image below is a quick snapshot from GoogleEarth just for some context of the study area. Fraser Island is the largest and northernmost of a series of sand islands created from south-to-north longshore transport. As Boyd et al. point out, at 1500 km, this is the longest littoral cell transport system in the world. The next image below (their Fig. 1) is a perspective image of the continental margin now looking toward the southwest. Fraser Island is at the top-center of the image. Note the arrows showing transport direction of the littoral cell to the north. Click on it to see a bigger and better-resolved image. 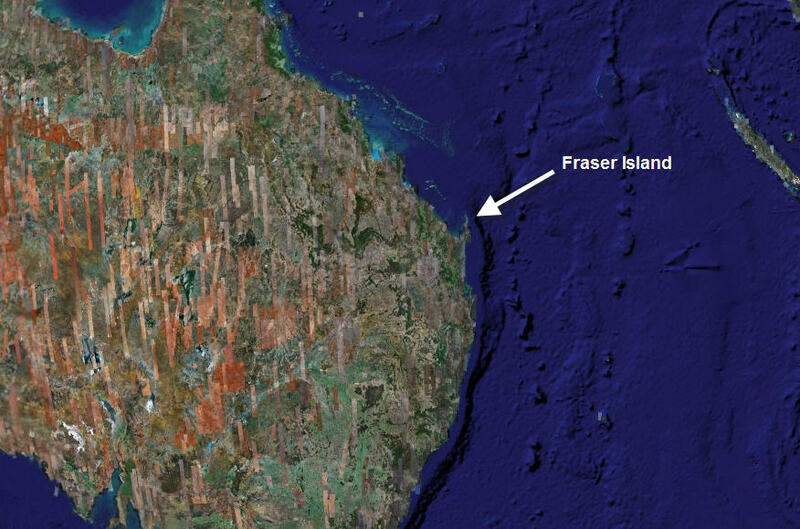 Fraser Island and its subaqueous extension, called Breaksea Spit, extend out away from the Australian margin as it starts to curve toward the west. This is where the sand transport aspect of the system is very interesting. The constructional Fraser Island-Breaksea Spit has built out to the edge of the continental shelf. When sand is reworked and transported along the system it intersects the shelf edge thus transporting the sand into the deep sea (called ‘intersection zone’ in their figure above). Note the erosional conduits cut into the continental slope just below the intersection zone. Last September I posted about a paper of a colleague of mine and others in our research group discussing a somewhat similar system in southern California. Details of the Fraser Island and southern CA transport systems are quite different, but, in a general sense, it is worthwhile to compare them. The most important aspect to compare is how coarse-grained sediment along the shoreline (where wave action in shallow water is strong enough to transport sand) gets to the steep gradients of the continental slope (where sediment gravity flow processes dominate). In other words, how is the shoreline connected to the slope? In the southern CA system, the shoreline is connected to the continental slope because a submarine canyon has cut back across the relatively narrow shelf. 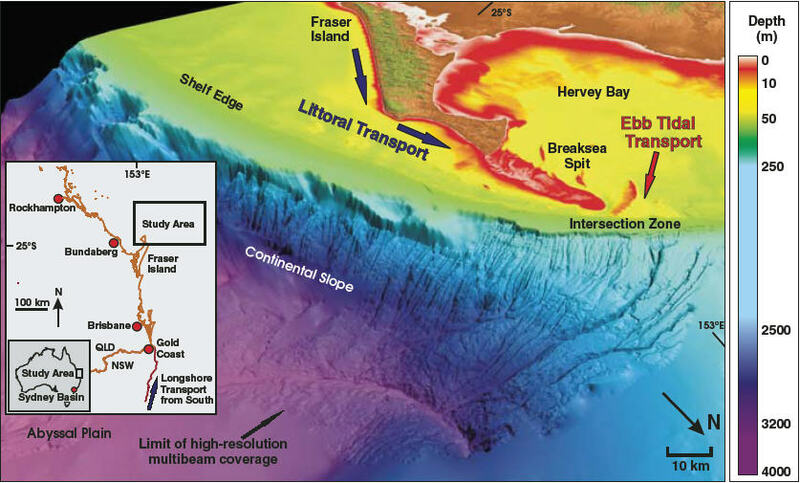 In the Fraser Island system, a depositional system has built out to the shelf edge. These systems are important to characterize because we are always trying to infer such transport pathways when we are investigating deep-marine sandstones in the rock record. Being able to draw upon examples from modern systems emphasizes the interactions of fundamental controls like tectonic setting and sea-level stands. Another important aspect of the characterization of these sediment pathways has implications to a broader understanding of exactly how other materials (pollutants, terrestrial carbon, etc.) make their way to the ocean.